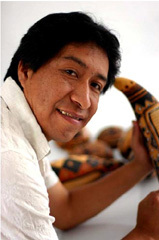 Tito Medina belongs to the fourth generation of gourd carvers; his parents Eulogio Medina and Guillermina Salome, are from Cochas Chicas, Peru which is well known for carving, etching, burning, and transforming gourds into unique works of art. Tito is a master craftsman and is known across the continent for his fine carvings and pyro-engraved gourds, each one telling a unique story. He has been carving gourds since childhood, and opened his first market stall in 1986. Through his work he has promoted the traditional craft of his region and has raised it to the level of a fine art. Over the years he has participated in several art fairs and received numerous awards for his work. Tito and his family run Medina Handicrafts – a company that exports hand crafted gourd ornaments, masks and musical instruments. The family employs about 20 gourd artisans from the area in their engraving workshop at Huancayo, Peru. Medina Handicrafts makes certain that the artisans employed with them receive consistent work and a stable income. The farmers from the costal town of Chiclayo, who harvest gourds for the company, also enjoy an abundant local market and consistency for selling their produce to Tito’s business, thus providing stability for their families and community. Tito Medina has also been invited to various events and fairs to demonstrate and teach his gourd-engraving craft. Since 2002, Tito has periodically participated in workshops in the United States and has also displayed his products at prestigious fairs such as the Santa Fe Folk Art Festival. To see a video of Tito Medina Carving at the Santa Fe Folk Art Festival click here. To see a video of Bertha Medina Carving at the Santa Fe Folk Art Festival click here. 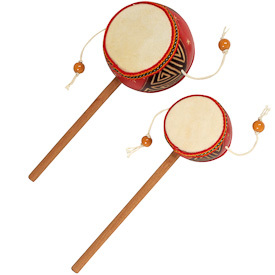 Damasa drums are a popular percussion instrument used all over the world. To play one, simply hold the stick between your thumb and forefinger and repeatedly twist it back and forth; this will cause the beads attached to the strings to strike the drum and create rhythmic sounds. The faster you twist, the louder the drumming. Now go ahead and make your own music! This Damasa drum was hand-etched from a gourd and burned with contemporary geometric patterns at Tito Medina's workshop in Huancayo Peru. Gourd carving is a traditional craft of the Andean mountain region and in the Medina family it spans four generations. The art of carving gourds is helping to bring sustainable income to more than 20 artisans and their families. Gourds are a natural and uniquely shaped vegetable, similar to a pumpkin or a squash. As such, designs and dimensions will vary slightly. Handmade, etched, and burned in Peru and fair trade imported. Peruvian artisans have practiced the art of gourd-carving for more than 4,500 years, transforming a simple squash into intricately designed bowls, boxes, windchimes, birdhouses, purses, vases and other bits of home decor. The twin villages of Cochas Grande and Cochas Chico, where our artisans Raquel and Esperanza live, work and run gourd-carving workshops to create local jobs, are the center of this ancient art. Over the centuries, artisans have found unique ways to craft gourd decor, including scratching, fine-line hatching, pyroengraving and carving. Naturally, the details and designs have changed, but contemporary artisans remain inspired by Peru's rich traditions. After the gourds are harvested, the artisan removes the outer green skin with a dull knife to expose the lighter brown color underneath. This will become his/her canvas. The gourds are cleaned and dried in the hot Peruvian sun. After drying, the artisan draws his/her initial design in pencil, then uses a carving tool to remove small pieces of gourd, creating a 3-dimensional version of the original design. Next, the artisan burns the pattern with a glowing ember, usually a feather-shaped piece of Quinual wood that's been heated over a fire, to establish contrast between the carvings and the gourd. The artisan can vary the intensity of the heat by blowing on the ember; the harder the artist blows, the darker the burn. Having obtained the color, the artisan washes the gourd to remove the pencil marks and polishes the finished piece with a natural wax. Sometimes, the artisan applies an oil/charcoal mixture to the gourd's carved surface. The dye adheres any part of the gourd where the outer skin has been removed, yet wipes clean from the gourd's smooth surfaces. This is why some carved gourds have a black background.